An 18-year-old who complained of seizures in the emergency room of an Indian hospital turned out to have parasites in his brain, according to a case study published Thursday in the New England Journal of Medicine. Drs. Nishanth Dev and S. Zafar Abbas of the ESIC Medical College and Hospital in Faridabad reported that the patient, who appeared in the ER with swelling over his right eye, was having tonic-clonic seizures. Formerly known as "grand mal" seizures, these neural disturbances cause stiffened muscles and a loss of consciousness. His parents said that their son had felt pain in his right groin for a week. A physical exam revealed that he had tenderness in the right testis and was feeling confused. To learn more about his condition, the medical staff performed an MRI exam and saw damage caused by cysts in his cerebral cortex (the outer mantle of brain tissue) as well as the brain stem, including the cerebellum, which sits at the back of the head above the spinal cord. Diagnosis: neurocysticercosis, a parasitic disease of the brain caused when someone swallows tapeworm eggs that have passed in the feces of someone who has an intestinal tapeworm. The larvae crawl out of the eggs and into muscle and brain tissues, where they form cysts. The doctors also discovered cysts in the patient's right eye and right testis. Because of the number and location of the cysts, his doctors decided against treating the young man with antiparasitic medications. These can worsen brain bleeding and inflammation while leading to loss of vision. Instead, the patient was given an anti-inflammatory drug, dexamethasone, plus antiepileptic medications. Two weeks after his arrival in the ER, the patient died, Dev and Abbas report. Cysticercosis infections occur worldwide, though these parasitic invasions of the human body mostly occur in rural areas of developing countries where pigs are allowed to roam and where sanitation practices are poor, according to the US Centers for Disease Control and Prevention. Though these infections may be rare among people who live in countries where pigs do not have contact with human feces, cysticercosis can be acquired anywhere in the world, including the United States and other western nations. Symptoms depend on the location of the cysts; sometimes, lumps form under the skin, and sometimes, confusion is the only sign of the damage occurring in the brain. Symptoms can appear months or even years after an infection, usually when the cysts start dying, causing swollen tissue. 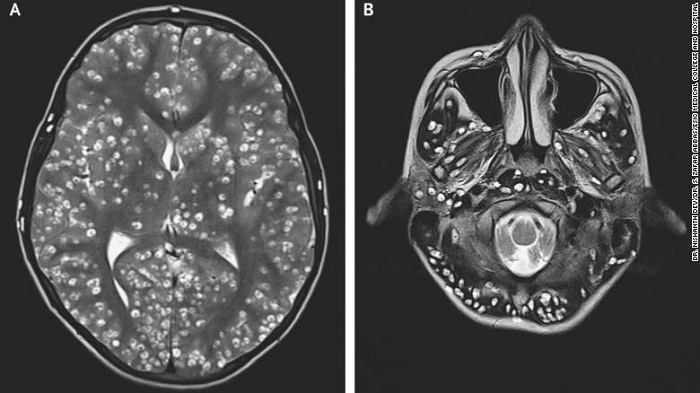 Generally, these infections call for anti-parasitic drugs combined with anti-inflammatory medicines, but surgery may be necessary if a patient doesn't respond or to reduce brain swelling. Symptoms may require care even if the parasitic infection itself no longer needs attention or treatment. Patients with cysticercosis cannot spread their disease to other people; it is only people with a tapeworm infection in the intestine who can spread the potentially life-threatening eggs when proper hygiene is lacking or ignored.